In the spirit of keeping a sales commission plan simple, many sales executives choose to use a simple straight-line methodology. In other words, 88% achievement of the sales goal equates to 88% commission earnings. Seems fair, right? It’s definitely simple. But it leaves out features and upside leverage that many sales reps and sales managers seek. Let’s explore further by introducing two variants to the straight-line sales commission methodology. I’ve also included a sales commission calculator for both. Side Note: The phrase “on target” is commonly used and is the same as “at-plan” in that both denote the amount of money (commission payment) to be made if the established sales targets are exactly achieved. There are four issues with a traditional straight-line commission plan. Let’s review them before evaluating possible solutions. Most sales reps expect to be excessively rewarded if they exceed their targets by large margins. If they achieve 150% of their quota, they don’t want to just make 150% of the sales commission plan but instead want to make something like 180% or 200%. If a sales manager has any sales reps performing below 50% in a given period, it’s really hard for that sales manager to make up for the miss across the other sales territories. A sales rep that regularly makes 70-80% of their sales commission plan could be too comfortable from a total earnings perspective. It’s never good if a sales rep is financially comfortable with commission payments that come with below-target performance. Imagine having a whole team of such reps and the overall impact to the company’s financial results. Depending on the size of the sales team being managed, it’s likely the performance at the first line sales management level regularly stays within a somewhat narrow range of perhaps 75 – 125%. And with a large team and multiple layers of sales management, the Sales VP might regularly finish in the 90 – 110% range. That doesn’t offer much upside or downside in earnings, neither of which are good. Just imagine the net profit impact of missing your top-level revenue target by 10%. You shouldn’t feel good about paying your Sales VP a full 90% of their commission plan for that performance. The conclusion of the issues above is that it is often better if the sales commission plan instills more “pain” for especially poor performance and more “pleasure” for exceeding the targets. The good news is that a relative sales commission plan doesn’t need to payout in a straight line starting at 1%. One variation uses a modified straight line payout calculation and another gets a little fancier with what are called “accelerators” and “decelerators”. We’ll explore each of these next. The modified straight line method starts the initial commission payouts at some agreed minimal performance level. Perhaps sales reps earn nothing until they reach 40% of their target. Once the minimum performance threshold is set, the slope of the payout line is re-calibrated so that 100% performance still equates to 100% payout. This means the higher the starting point for payouts (the minimum performance threshold), the steeper the resulting payout line. This plan is still simple to understand plus it has the advantage of built-in accelerators and decelerators. I use it all the time. The graph above reflects a minimum performance threshold of 50%, which means that each 1% of performance above that minimum equates to 2% commission payout. There is pain to the sales rep below 100% (notice that 70% attainment only pays 40% of the at-plan commission amount) and pleasure/accelerators above 100% (notice that 150% attainment pays 200%). Side Note: As suggested before, the volatility and variance of performance at a sales executive’s level is much lower than an individually-contributing sales rep. This is because the executive’s results are an aggregation of all of the sales professionals (reps and managers) that report to them and that tends to average things out. In other words, where an individual sales rep might finish at 40% of quota or 200% of quota, that level of variance for a sales executive is almost never seen. Because of this, you might set the minimum for a sales rep at 40%, a sales manager at 50% and a sales VP at 60%. The concept is similar to the modified straight line but with a twist. Above a certain performance level, “accelerators” are applied. Below a certain performance level, “decelerators” are applied. These are nothing more than adjustments made to an otherwise straight line commission calculation. The accelerator is almost always applied for performance that exceeds 100% and the accelerator only applies to the portion of the performance that is above 100%. As for the decelerator, it is applied for performance that falls below a stated threshold. The exact threshold is set by the sales executive. The graph below shows the sales commission payout using a 0.5x decelerator factor for performance below 50% and +1.0x accelerator factor for performance above 100%. Decelerator – Any performance below 50% is multiplied by 0.5 to determine how much of the commission opportunity should be paid (the commission opportunity is the “at-plan” or “on target” amount that equates to exactly meeting the sales targets or quota). 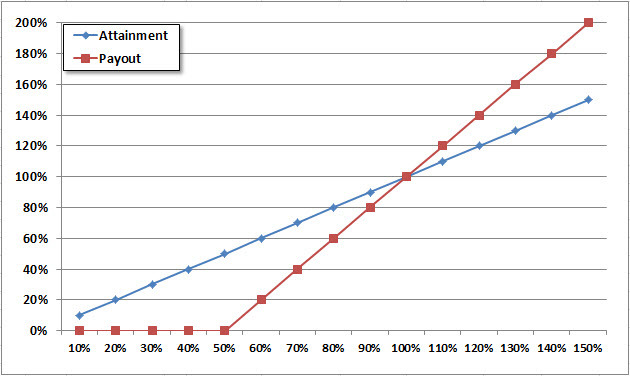 A 40% performance versus the quota equates to a 20% payout against the commission plan (40% x 0.5 = 20%). Straight Line – Notice that in between the thresholds defined for accelerator and decelerator use, the payments follow a straight-line methodology. So a 90% equates to a 90% payout against the commission plan. Accelerator – The portion of the performance that is above 100% is multiplied by 1.0 to calculate the accelerator amount and that is added to the regular straight-line calculation. A 120% performance versus the quota equates to an additional 20% accelerator (20% x 1.0 = 20%). The accelerator is added to the straight line 120% base commission for a total payment of 140% of plan (20% + 120% = 140%). Although it’s not super complicated, it is definitely more involved than the simple modified straight line approach. One benefit is that it offers at least some commission payments for performance that is below the minimum straight-line threshold. The downside of this approach is that sales reps that are comfortable at the 70-80% payout levels still get that for 70-80% performance. I guess you could start with a decelerator and then at a certain performance threshold jump to a modified straight line. A sales commission plan is a very important but delicate tool to properly motivate the sales team. Done properly, everyone’s interests will be aligned and magic can happen. Done poorly and all sorts of chaos and misbehavior can ensue. Make sure to first understand the 5 Golden Rules for Setting Sales Compensation Plans and then decide if an absolute or relative sales commission plan is best (see related article here). If it turns out a relative commission plan makes sense, then decide if one of these modified versions of the straight line methodology helps you instill the proper motivation and alignment with company financial objectives. Click on the graphic to the right to download a commission planning and payment calculation spreadsheet for the two sales compensation methods described in this article. Feel free to modify it and share it with others. This is very helpful but I am having trouble interpreting the file. I would love some assistance. 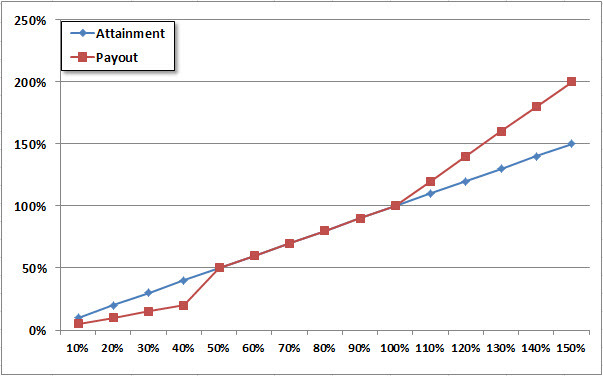 We have a very narrow range of achievement 50% payout at 98.5% achievement up to 200% payout at 101.5% achievement. How would I use your model with these figures? 3. Change cells B73 through B87 to reflect a much narrower range such as 97.0%, 97.5%, 98.0% . . . 100.0%, 100.5%, etc. I just did a quick test and it seems to work fine, assuming your payout calculation continues beyond 101.5%. If not, then just stop there with the graph and make sure to properly explain in the sales compensation plan document (see my article titled “Documenting Your Sales Compensation Plan”). This is a great spreadsheet and very useful to show charts. I used the straight line method. Is there a way of adding the actual $$ of achievement to show the payout achievment? Thanks for the compliment. I’m thinking what you’re requesting is reflected in rows 45-49 and 95-99 of the spreadsheet. Of course, you can edit the spreadsheet to include any feature that’s appropriate for your business. This is just a conceptual model.